As an ecommerce brand, email can be your highest ROI sales channel. But if you think just sending a bunch of newsletter emails to your entire list or a single abandoned cart email is going to get the job done, you are in for a rude awakening. Think about it — when customers visit your site, they are at different points in their relationship with you and your brand. You need to meet them where they are and you need to create multiple emails to do so effectively. You need to be using lifecycle email marketing. What is Lifecycle Email Marketing? Think of the customer’s engagement with your brand as a journey — a series of small steps they take on their path to buying your products. Lifecycle email marketing is all about first understanding and defining those steps, then sending emails to customers at the critical points of that journey to help them take that next important step forward toward a purchase. Visits store a second time. Adds items to cart but leaves again. Returns to site 4 months later to place a second order. That’s a lot of different customers at a lot of different lifecycle stages. And your customers might go through many more. Your mission as an email marketer is to anticipate the steps in the customer journey and use email as natural touch points to lead the customer through their lifecycle (and your sales funnel) — resulting in more (and faster) sales for you. When people give you their email address, they expect you to email them. And an email nudge from you can make all the difference to your bottom line. 1. When a customer visits the store for the first time. Most store owners get this wrong by expecting a first-time visitor to buy immediately. Then they get upset when their new visitor conversion rate is low. This is essentially like trying to propose marriage on the first date. Typically, I’ve found a new site visitor is going to need anywhere from 5 to 15 experiences or touch points with your brand before they are ready to buy. At this stage, the goal is not an instant sale, but an opportunity for your brand to build a relationship with the visitor and turn them into a customer. You can use storytelling and strong content to nurture first-time visitors and sending off a series of welcoming emails gives you a chance to tell your story, point out how you are unique, and explain why they should trust you. Use email acquisition offerings (like pop-ups and exit intents) to capture first-time visitor email addresses and send them a welcome series containing a mix of content and sales promotions. 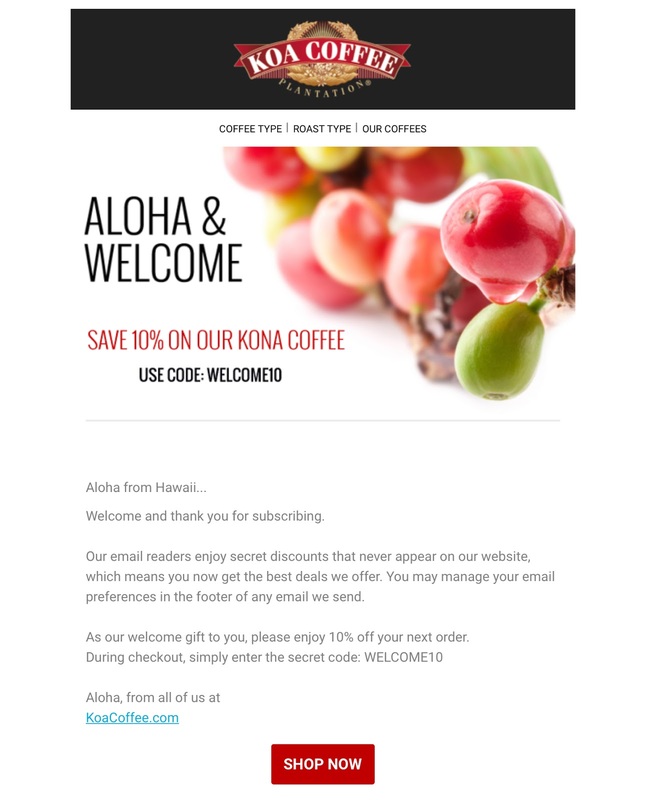 After visiting the Koa Coffee website and signing up for emails, potential shoppers are greeted in their inbox with a short but impactful welcome email. Readers are incentivized with a 10% off coupon, which helps to increase quick conversions. It also includes a 10% discount offer to help the reader feel compelled to make their first purchase. 2. When the customer browses some products but leaves your site. Consider what might be holding your customer back at this stage and address this by email. Maybe you need to spotlight the positive reviews a product has received on your site. Maybe the customer just needs the nudge of a discount or free shipping to complete a purchase. Try testing the addition of these elements into your email campaigns, to see if it garners an increase in click-through rate (CTR) or conversion. Whatever your findings show, this is an important time for outreach because you don’t want to lose a customer who’s come this far. Bliss sends out reminder emails to people who have browsed an item. With true-to-brand language and colors, they’ve crafted a message that incentivizes the purchaser to come back, while also suggesting other products. Utilize a browse abandonment email series that references the exact product or products your customer was viewing. 3. When the customer adds item(s) to their cart but leaves again. Abandoned carts can kill a business. You’ve got a customer to this point in the purchase funnel and you are so close. In this case, your customer might just need a reminder that they left the item behind. Or, depending on your product, they might not feel 100% comfortable buying from a business or brand that’s new to them. Using incentives like discounts, free gifts, shipping, etc., might be the push they need to make that first critical purchase with you. Abandoned cart email campaigns are a tried-and-true email marketing format. In a 2017 survey, abandon cart emails were ranked as the number one most effective method in triggering new sales. After adding an item to their basket and abandoning the site, users from the Eloquence website are greeted with an email that outlines the product they’ve left and reminds them to complete their purchase. They also provide information about their customer service information, incase the reader has any questions. Set up your abandoned cart automation to send multiple emails that remind the customer of what was left behind. Depending on the cart value, offer incentives to bring them back. 4. When the customer completes their FIRST purchase. What do you want a customer to do after they buy from you? You want them to come back and buy more! You’re not in the “making sales” business. You are in the REORDER business. Customers are most open to buying more immediately after a sale. They are riding the “high” of their purchase and have an immediate boost of loyalty with your brand. Make sure to use this to your advantage. Post-purchase emails (the emails you send immediately after a purchase) should focus on building loyalty and making shoppers feel like part of your community. This should start with the sales receipt you immediately send (too many companies miss out on marketing here). These emails can focus on sharing additional information about their last purchase or cross-selling. This can also be a great time to introduce exclusive offers or loyalty programs. ThinkGeek makes it short, sweet, and true to their quirky brand voice. After shopping for an item, it makes a guest star appearance in your email, as well as a few other items that might pique your interest (depending on what other people with similar tastes also bought). After buying an item at Everlane, shoppers receive a personalized email from the product designer asking for their feedback. They also are offered a chance at winning a $200 gift card for every review left. Outline an email automation flow that sends specific emails to your customer immediately after their first purchase and over the following 2 weeks. Use content to build the relationship and sales promotions to upsell and cross-sell other products in your catalog. 5. The customer returns to your site again. This is what you’ve been working for – creating a repeat customer. They’ve purchased, they’ve come back, and now you need to convince them to buy again. This a great time to roll out cross-selling offers, subscription offers for consumable goods, tiered discounts, or a unique, special offer just for customers at this point in the lifecycle. Quip email subscribers receive an email in their inbox after a certain time has passed without an order. They make a sweet deal: your first refill is free. Continue to send automated email flows to customers after every purchase. Segment them by the number of purchases, type of product, and dollar amount spent. 6. When customers get “power buyer” or “mega fan” status. Let this customer know you appreciate their loyalty by noting milestones in your relationship – like the first time they bought from you. You can also put this enthusiastic customer to work for you. Ask them to share their opinions of your product and post a review online for other shoppers. Or, utilize a loyalty and referral program to incentivize them to spread the word. You can also remind these shoppers when it’s time to reorder if you sell consumable products a customer will run out of. “More! Insiders” at Saks Off 5th get exclusive sale offers throughout the year. The club is easy to join, but adding language in these emails about exclusivity and time-bound deals helps to gather buzz. Create a VIP customer segment targeting your most engaged and best customers. Offer them special pricing or limited-edition products runs. These people are your brand advocates. Nurture them through steady email communication. If you want to build a successful lifecycle email strategy you need solid infrastructure in place to logically distribute these emails. Email marketing is one of the cheapest ways to capture buyers – so spending time and money to build a great distribution method will be worth it. You want emails to be triggered automatically when shoppers interact with your site. Every step of the lifecycle needs to have one, if not multiple, automated emails that are launched when shoppers take certain actions. Be smart about how you sequence these emails and consider your customer demographics carefully when mapping out your strategy. You need to know who your customer is and what speaks to them as a person and a consumer. That way you know what steps you need to take to make them trust you and your brand enough to buy. Target Lifecycle Stage. What stage of the customer journey does the flow target? What is the goal of the sequence in your larger marketing strategy? Qualifying Trigger. What behavior will trigger the email flow? Should filters be added to exclude certain segments from entering? Branching logic. What logic will you add, using “if/then” splits, to create customized paths? Number of Actions. Decide how many emails you want to include in a flow. Consider A/B testing to determine if adding additional emails leads to more conversions or a drop in engagement. Timing. Timing is everything. Use data to determine how long you should wait to send an email after a customer acts and carefully consider the timing of subsequent emails. These are manual emails you want to send to your customer list (or segments of it) on certain days during the month. MAC Cosmetics steps away from selling products and instead conducts interviews with makeup artists as part of an editorial series. Skullcandy offers a flash sale during the winter holidays. Bliss Beauty announces a new product with an accompanied note from an eager purchaser that loves the product. AirBnb does a fantastic job of highlighting weekly round-ups of locations in a blog-post fashion, while also promoting their core product. These are generally focused on a specific brand or external event versus an action a customer has taken in your store. As common as these are, most stores get these emails wrong. For example, they end up sending every email to their full list. In order to see high levels of email engagement (open rates and click rates) it’s important to send your email campaigns to specific segments of your list. How often should I be sending a customer (or prospective customer) an email? We obviously get this question a ton at Blue Stout. If you want to get the most out of lifecycle email marketing, break your customers into segments based on engagement, interests, spend, etc. Once you have segmentation, you can send different email content that specifically speaks to that group. But keep in mind it can take a while to fine-tune your segments. We recommend that clients break customers into four or five segments to start, based on engagement. Then you can eventually grow to as many as 15 to 20-plus segments once you have more nuanced data about your customer’s habits. Email list health is the most overlooked and important part of your email strategy as you begin to scale – so you DON’T want to skip this part. I’ve lost track of the number of brands that have seen their email revenue cut in half due to poor email list management. Having a healthy list means you’re staying out of the customer’s spam box, maintaining high open and click rates, and only sending emails to your engaged users. For example, if your email open rates drop, Google might send your emails straight to spam folders instead of your customers’ inboxes. As your email list grows it becomes more and more valuable, but only if those emails actually make it into an inbox and get opened. “If your campaign open rates are below 10%, you’re probably doing something wrong. How do you know if your email marketing is working? How many people are actually opening your email? While email marketing does better in some industries than others, the average open rate overall is 20.81%. If your campaign open rates are below 10%, you need to boost that quickly. It could be as simple as crafting snappier, call-to-action subject lines on your emails. Or maybe it’s a fundamental issue with your content. However, most likely, you are not sending the right emails to the right segments of your list. Whatever the reason, it’s important to pay attention to open rates and be nimble about making adjustments to your strategy. When a customer opens your email, do they click an offer or piece of information to learn more? The average click rate is only 2.4 percent, so it’s important to make email copy compelling and give the customer a clear call-to-action. How much revenue are you earning from email? We see most ecommerce websites generate at least 20 to 30% of their total revenue from email. But great stores – ones who implement a robust email strategy – can earn 40% or even more than 50% of their revenue from email marketing. In general, there should be a 50/50 split between revenue from your automated email flows and revenue from your manual campaigns. If your store is generating less than 25% from email marketing you should definitely be reaching out for help as you are likely leaving a lot of money on the table. There’s a lot to consider when devising your email strategy – timing, segments, messaging. But how you package that message matters too. You want crisp subject lines that grab attention and eye-pleasing designs that will appeal to your audience. Words do matter and with a subject line you’ve only got a few, so pick them wisely. First and foremost, you want to keep your subject line short (less than 120 characters) and simple. And don’t forget to take advantage of using a pre-header. Personalization works – Call us narcissists, but we like to see our names in print. Interestingly, while first name is most commonly used in subject lines, the study found that using first and last name has the largest positive impact on open rates. Always try to personalize the experience as much as possible. “Free” can fail – Shouting “Free” in a subject line might work for some, but it doesn’t compel many retail shoppers to click. Not saying that you won’t have luck with it, but be sure to do some A/B testing to check out the success. “Important!” gets opened – Used judiciously, words like “urgent” and “important” resulted in open rates that were much higher than normal. People don’t want to miss out, and time-sensitive emails get noticed. Announce and invite – It’s simple. People love getting invitations to special sales and events. And they also respond to announcements, if only because they’re intrigued. Say thanks – Your mom was right, you should always say “thank you.” The MailChimp study found that people love being thanked right in the subject line. So never miss a chance to do so. John, Welcome to Blue Stout! What to expect. Get a headstart on Holiday shopping. My #1 recommendation is to build intrigue with your subject lines as much as possible. Entice your customers just enough to want to know what’s inside. Don’t be afraid to use color – Bright backgrounds, color blocking and contrasting colors are popular ways to attract eyes and create interest. Keep it mobile-friendly – Your emails should be built to look as great on mobile phones and tablets as they do on a laptop. And your message should be quickly consumable with a clear call-to-action above the page fold. Keep it clean – Tidy, uncluttered design works and your emails should take your customer on a journey (preferably through the purchase funnel). Be generous with white space and don’t overwhelm the customer with words. Be different – Try out different design options, use grids or geometric shapes to breakout information you want to highlight. Use cool animations, infographics, and interactive links to engage customers who want to explore. Clean, colorful and mobile-friendly messaging is critical. Don’t overlook the power of visual images and don’t be afraid to try new designs. Email marketing is the best and fastest way for ecommerce stores to grow revenue and increase profits from their current traffic and customers. And if used correctly, it should be your highest ROI sales channel. Yet too many ecommerce businesses still fail to launch engaging and successful email campaigns and instead bombard customers with ill-suited offers at the wrong time. Lifecycle email marketing demands that you meet the customer where they are and effectively push them through your purchase funnel faster. It also allows you to reward loyalty, cross-sell and upsell – which are all incredible ways to stoke repeat purchases. Join our webinar with Blue Stout, a BigCommerce Certified Partner.